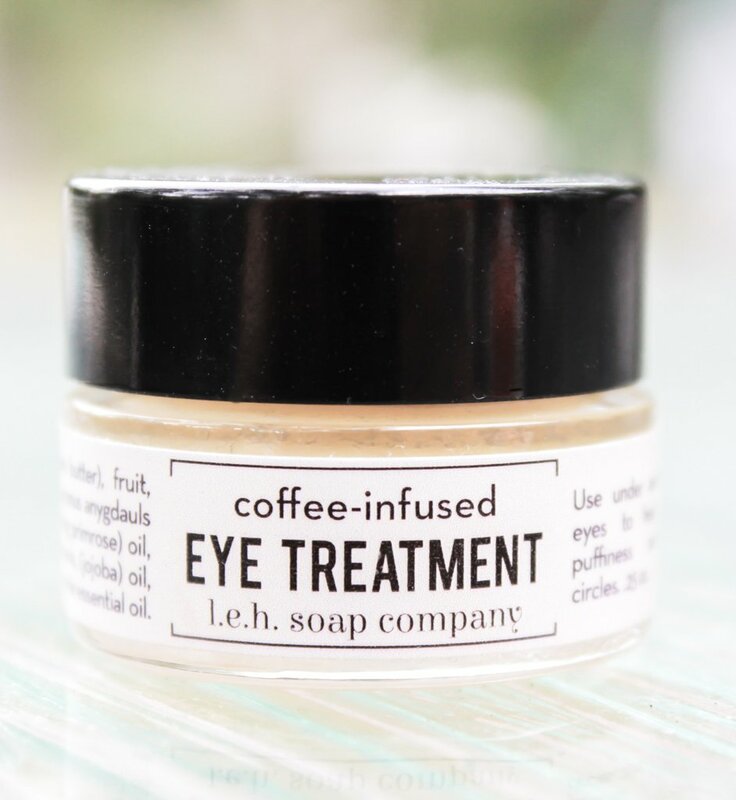 The Coffee-Infused Eye Treatment helps reduce the appearance of dark eye circles. I’m sure part of the success of L.E.H. is also in the fun with the naming and marketing of their products. 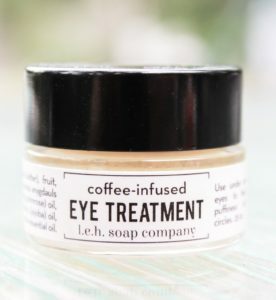 Here are a few examples; you judge for yourself: Facial and Lip Care: Coffee-Infused Eye Treatment: Fresh coffee infusion and chamomile essential oil will reduce inflammation and appearance of dark circles. Lavender essential oil and coffee infusion will improve circulation and reduce puffiness. This powerful blend of our favorite oils will keep help keep the delicate area around the eyes looking healthy, happy and youthful. Body Butters and Lotions: Apple Martini Body Butter: Get intoxicated by the sassy scent of our Apple Martini line! Crisp, clean and perfectly fruity! Combat your dry skin and keep it smooth, young and soft. Sugar Scrubs: Apricot Sugar Scrub: The sweet and fresh scent of this delicious fruit will hit you as soon as you open the jar! A non-greasy, exfoliating sugar scrub handmade with Vitamin E and Jojoba oil for extra moisture. Foot Scrubs: Cooling Foot Scrub with Peppermint and Tea Tree: Keep your feet looking and feeling their best. Handmade with ground pumice and tea tree, this all natural foot scrub will remove dead skin cells while killing odor causing fungus and bacteria. Peppermint oil will leave your feet feeling cool and relieved. For Guys: The Men’s 6-Pack Sampler: Gentlemen, we have you covered with this sampler just for you (and those who love to smell you). Includes: Gentlemen Only, Walk in the Woods, Almond Crumb, Spicy Bay Rum, Honey & Olive, and Olive Oil Smoothie. To this day at their headquarters location in Marmora they are proud of the fact that they still lovingly make, cut and wrap 800 lbs. of soap each week, one small batch at a time. Kathy could have moved to a mass-produced model for her products, with bigger sales, but that’s not what she wanted or is about. This is literally a “hands-on” business; one that Kathy has put her heart and soul into and it’s great to see an NJBIA member achieve success doing it her way with such care and dedication. You can learn more about L.E.H. Soap Company, and have fun doing so, by visiting their website, Twitter or Facebook pages. L.E.H. Soap Company is just one of 20,000 companies that comprise NJBIA’s membership, which is very diverse with representation from an amazingly large and wide spectrum of fields, industries and professions. Look for more unique stories about NJBIA members in future issues of “Beyond 10 West Lafayette,” NJBIA’s membership blog.